Weems made all of the photos in her own kitchen, in her own house. All of the vignettes are set in the kitchen at the table and were shot with a single overhead light source suggestive of an interrogation room. The table and light are fixed elements. Beyond capturing the ultra stylish hipness of his post-colonial cohorts, Sidibé joyfully affirms the lives, identities and aspirations of a generation reaching for freedom and asserting their modernity into the world. Beyond that, his photographic images have become part of a visual lexicon that resonates and extends to communities worldwide. 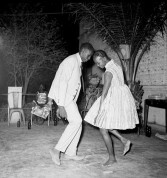 Eve Sandler on the late Malick Sidibé.